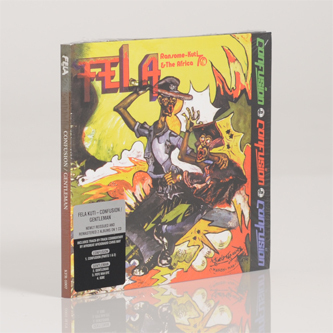 *Includes two newly remastered Fela albums in one package* WOW! 'Confusion' is an exceptional record in one of the most outstanding oeuvres in 20th century music. One long, 20+ minute piece split over two sides, it's possibly at once the most abstract and urgent missive we've heard from the man and his legendary band. You'd be forgiven for questioning whether you're even listening to Fela for the first five minutes of side A, with spare, rolling percussion and daubs of plangent sax sounding more like some ECM recording of European avant-garde or Soft Machine psychedelia, before it patiently begins to coalesce around deepest bassline and funk breaks, evolving into a supremely heavy instrumental to the run-out. B-side Fela finally comes, the groove settling into a tough, tense vehicle for dubbed-out call-and-response lyrics warning that the European influence in Nigeria and Africa would come to an end. It's just floored us and we reckon it will you, too! Highly recommended.